In my last post I showed you this photograph, and left you wondering where it was taken. I have some more photographs taken on the same day, which shows the Dinnis and Cleeve families having a lovely day out together. 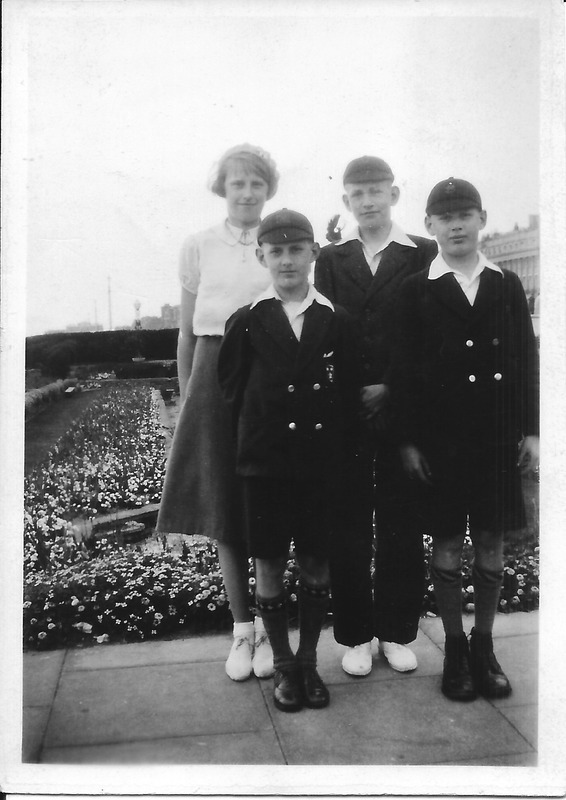 Here we can see the Dinnis children, looking really smart, and enjoying the Brighton seafront and summer day. I thought how well dressed they were, almost as if they were in their Sunday best clothes. And upon investigation – the 9th June 1935 was indeed a Sunday! It’s nice to see the two younger brothers, Ron and Gordon looking immaculate. I wonder how long they managed to stay looking like that before the inevitable game of football started up and the socks fell down and the shirt collars wrinkled! Back row, left to right, Gordon, Ron, Jack and Nancy. Joseph, Ernest, Annie, Dora and Edith. In this photo from the same day we can see it had been an extended family day out. Annie and Joseph Dinnis and their four children spent the day with Annie’s sister, Edith Doswell, her husband Ernest and their daughter, Dora. What a lovely time they must have had, although I would guess the Dinnis children had to be on their best behaviour. 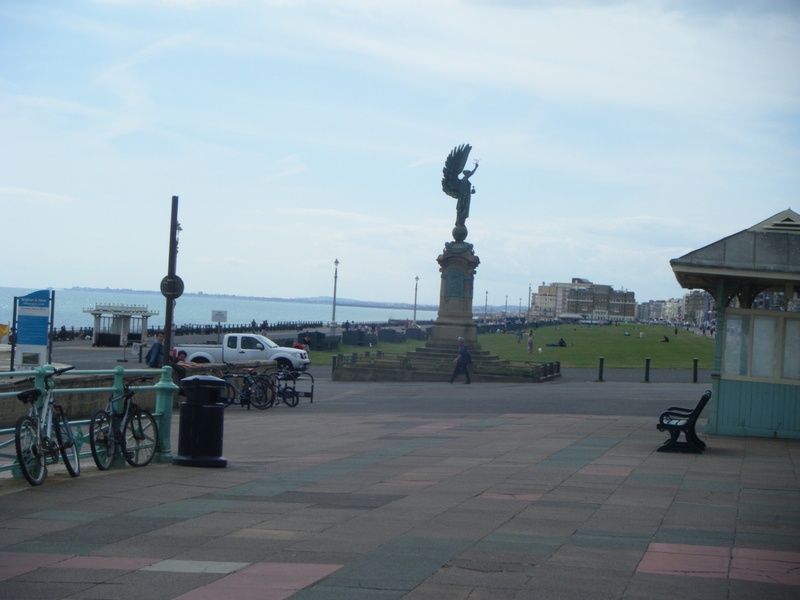 This photo was taken at the foot of the Peace Statue, which still looks the same now as we can see here. The railing they are sitting on is the same today. 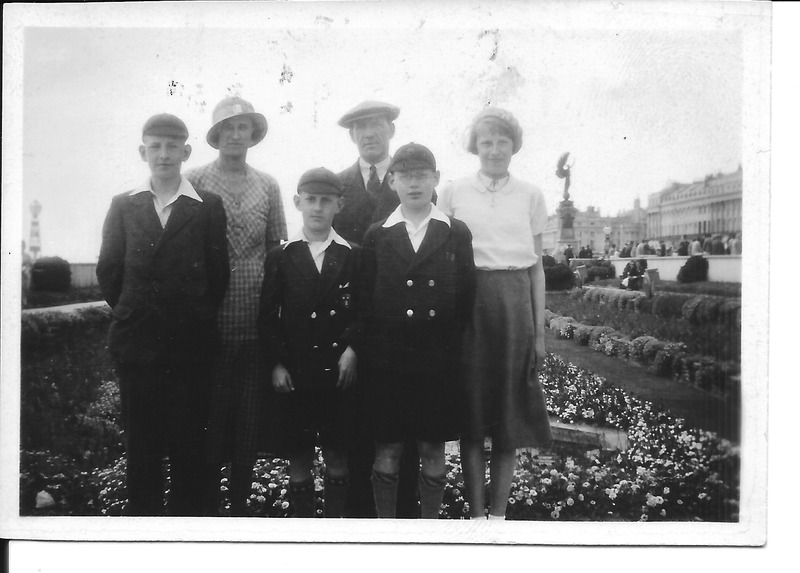 I am so glad to be able to see these lovely old photographs of my father, Gordon and his family and to know they spent time enjoying a Sunday in Brighton and Hove with the extended family. 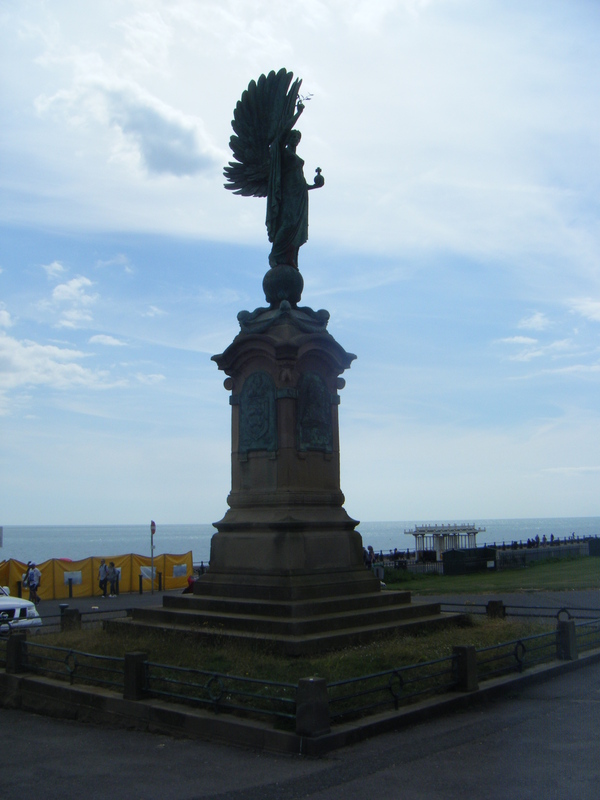 This entry was posted in Annie Cleeve, Edith Maud W Cleeve, Gordon Charles Dinnis, Jack Douglas Dinnis, Joseph Taylor Dinnis, Nancy Dora Dinnis, Ronald Stanley Dinnis and tagged 1930s Brighton, Dora Doswell, Hove, Peace Statue, Sunday best. Bookmark the permalink. That’s interesting Jackie, I expect they chose Sunday for the photo because they would be dressed accordingly. 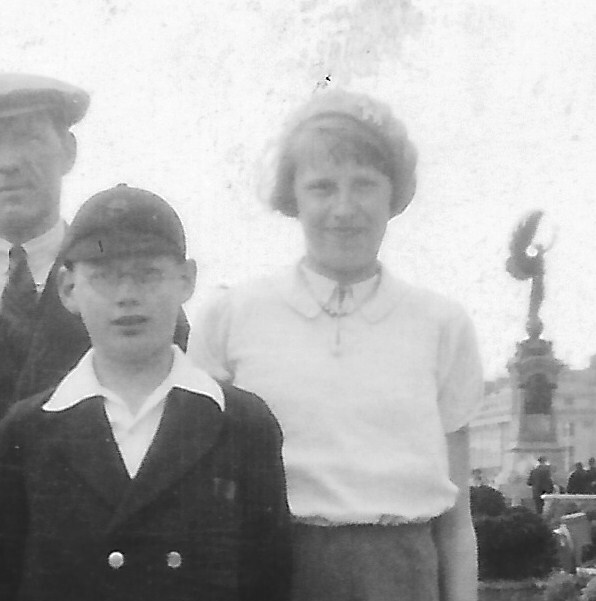 Do you have any informal old seaside photos? I was looking for a photo of a man paddling with a handkerchief tied at the four corners to make a hat, as I remember a few people used to do at the beach when they would roll up their trouser legs to paddle, I know my family had some photos of that, but I couldn’t find any such photo online! Haha thanks! I new it couldn’t have been just the men in my family that did that! How wonderful to have all these family photographs, and to know who they are. 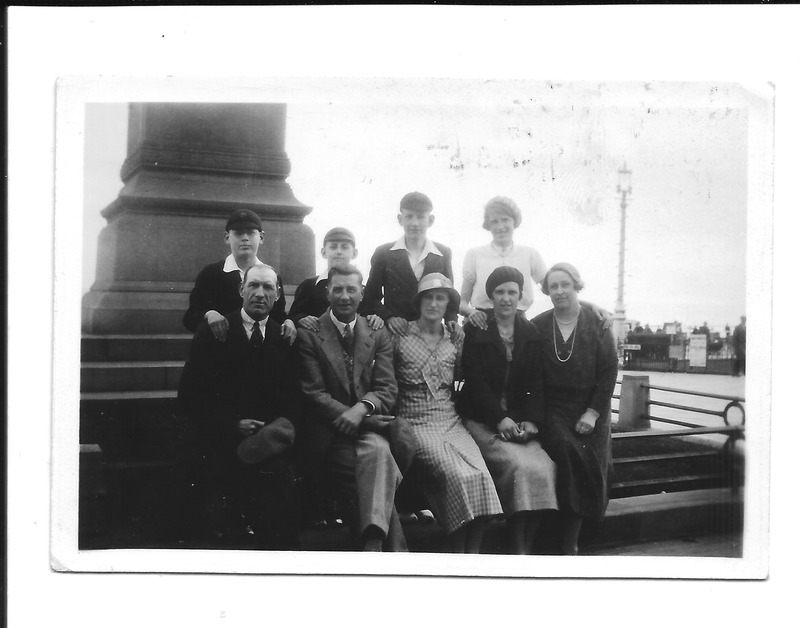 I’m at the moment going through our family archives with my parents but of the few of the rare photos we have from before 1930 there are quite a few where we don’t know who everyone is. What a great idea to go through the family photographs with your parents while they are still here. Even if you don’t know who everyone is, it is still possible to find out by persistent work with ancestry and blogging, and finding other relatives you didn’t even know you had! Such fun! My dad has dementia and we’ve realised if we don’t do it now it might be too late in a few months. It is as you say great fun, and fascinating to observe the change in style from formal portraits and serious faces even on a wedding day to smiles and relaxed poses today.